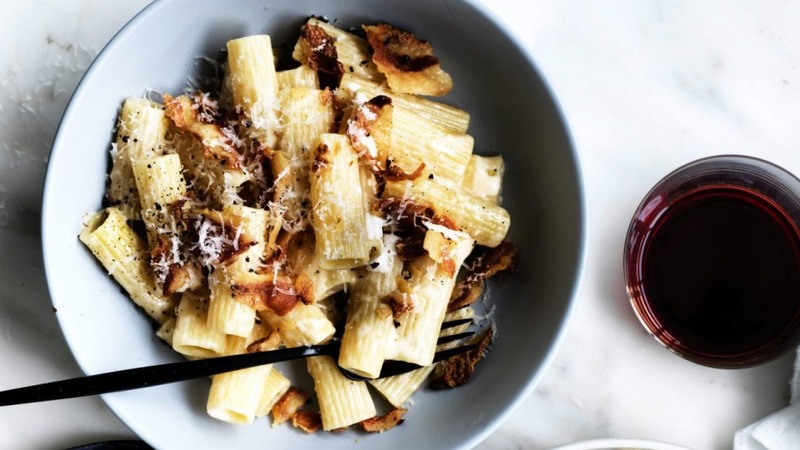 The flavour from the pork cheek and cheese is just perfect in this white amatriciana of Rome. 1. Bring a large pot of salted water to the boil. Add the pasta, stir well and cook for one minute less than the time indicated on the packet. Before draining, spoon ½ cup of the starchy foamy water off the top and reserve. 2. Meanwhile, heat a large frying pan and add the guanciale (available from quality Italian butchers). Cook over medium heat in batches, if necessary, for 3 to 5 minutes, until the guanciale releases its fat and becomes crisp. Turn up the heat and pour in the wine, then cook for a couple of minutes while the wine reduces. 3. Add the drained pasta to the pan, along with 3 tablespoons of the reserved starchy cooking water. Mix everything together and continue to cook over medium heat until the pasta is al dente. Remove from heat, then stir in the pecorino to thicken the sauce. 4. Divide the pasta between four bowls, add a grind of black pepper and a bit more cheese if you like, and serve immediately. If you like this simple recipe, try my cacio e pepe (cheese and pepper).